The book is an outcome of a national conference on Women-led Water Management organized by the SM Sehgal Foundation along with UNICEF India in 2012. Inequalities based on gender are present everywhere and at every level and in all aspects of social life. Access to safe drinking water and adequate sanitation is a human right that is key to improving gender equality. This book is a very useful addition to the gender and water, sanitation and hygiene (WASH) sector as it brings together in one book a large body of work done in different parts of the country. It aims to fulfil the existing gaps in knowledge and practice by providing solutions towards desired outcomes in WASH programmes by presenting grass-root initiatives from different parts of the country. Divided into four sections, the first one has five chapters that provide an overview to the sector, identify gaps in the existing conceptual frameworks, knowledge and capacity building initiatives. This section also provides pointers to what could be the way forward in all of these areas. The editors give an overview, in the introduction, of the gender concerns in WASH. In ‘Accelerating Gender Outcomes’, Sunetra Lala, Malika Basu, Jyotsna and Aidan Cronin review the existing gender analytical frameworks and argue for a need to develop a dedicated ‘hybrid’ gender framework that is aligned with the typical phases of WASH which include planning, implementing and monitoring. ‘Vulnerability From Water Shortages’ by Yusuf Kabir, Niranjan Vedantam and M Dinesh Kumar assesses the vulnerability of rural households as a result of lack of water for both domestic as well as productive purposes and suggests an index that can help communities to measure vulnerability with regard to accessing water. Anjal Prakash and Chanda Gurung Goodrich in ‘Crossing Boundaries: Gender and IWRM in Education and Research’ have documented the approaches, outputs and outcomes of the Crossing Boundaries Project initiated by SaciWATERs (South Asian Consortium of Interdisiplinary Water Resources Studies) in South Asia. The initiative emphasized on the need for bringing in interdisciplinarity in water studies. Through ‘education, impact-oriented research, networking and advocacy’, the programme was able to influence the Water Studies discourse in four countries of South Asia. ‘Gender and WASH: Capacity Building Initiatives’ is a comprehensive review by Swati Sinha of the various capacity building initiatives in the WASH sector in India through a gender and equity lens, arguing for gender sensitive content in capacity building initiatives in WASH. The chapter brings out the gendered nature of this training both in terms of the content and the participation. Section two includes six case studies from different parts of India. This is an interesting section which on the one hand discusses the drudgery and the impact on women and girls as a result lack of water, but on the other documents the exemplary cases across India led by women to ensure water security. In ‘Gender Issues in Watershed Management’ Suhas P Wani, KH Anantha and T K Sreedevi discuss the role of women in watershed development programmes in the semi-arid villages of undivided Andhra Pradesh. It argues for the need for an integrated watershed development programme over the conventional watershed development programme which according to the authors fails to address the concerns of women and other marginalized communities. ‘Gender and Governance: A Case of Jalswarajya Project’ by Aditya Bastola discusses the decentralized water governance programme in Maharashtra. Bastola shows through evidence that the promise of decentralization has failed women and the marginalized as their participation is constrained by caste, patriarchy, and other forms of discrimination. Rather than empowering these sections, it has led to the capture of institutions and finances by the rural elite who usually represent the upper castes and class male members. The paper by Pradeep K Mehta and Niti Saxena discusses the extreme scarcity conditions in the Mewat region of Haryana and the impact on women. The study compares the hardships women face in villages where potable water is unavailable and those where only saline water is available. It shows through evidence that the drudgery and socio-economic and health impact are greatest on women and girls and yet their participation in decision making is very low. It highlights the failure of public policy in water-provisioning, compelling the poor to invest more and more in sourcing water. ‘The High Fluoride Burden and Tribal Women: Occurrence and Remedy’ by Tapas Chakma, Gregor von Medeazza, Sanjay Singh and Pradeep Meshram brings in interesting insights of how the impact of high fluoride content in water, due to depleting groundwater levels, has damaging effect on women because of their poor baseline nutritional levels. Calcium deficiency is seen to be particularly impacting women in the reproductive age when the demand for calcium is the highest. The way forward is seen in the integrated fluoride mitigation intervention which combines availability of safe potable water with nutritional supplements of calcium, vitamin C and other iron rich food stuff. But success of the project hinged on women’s role as the key change agents. KAS Mani, Vallaperla Paul Raja Rao, Madhukar Reddy and Ch. Ram Babu in ‘Women’s Voice in Water Resource Management’ argue for the importance of valuing women’s knowledge. The study located in seven drought-prone districts of Andhra Pradesh implemented innovative aspects in the groundwater management programme. It focussed on bringing data gathering and technical knowledge into the public domain by involving women and other marginalized communities and through the former water schools trained women to understand their water resources and to measure and plan for its sustainable use. The project inspired several similar projects to bring women to the centre stage of planning and implementation but importantly also argued for the need for an overall shift in the attitudes towards women and respecting their knowledge. 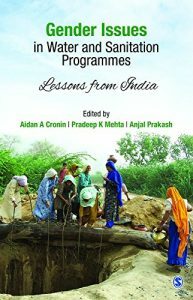 ‘Leadership and Participation: Role of Gender’ by Sudhir Prasad, Satyabrata Acharya and Somnath Basu shows how success of the water programme called for building leadership of women, involving them in the designing and planning of projects and understanding their perceptions about water security. Located in Jharkhand, the case study discusses successful implementation of Government-NGO partnership programme. Section three includes four case studies on sanitation from Maharashtra, Madhya Pradesh and Uttar Pradesh. ‘Enabling Gendered Environment for Watershed Management’ by Eshwer Kale and Dipak Zade argues for creating appropriate institutional spaces for women and building their capacities while also stating the need to include water, sanitation and health as part of the watershed programmes. They discuss the experience of WOTR (Watershed Organization Trust) in Maharashtra to substantiate these ideas. ‘Women Led Total Sanitation: Saving Lives and Dignity’ by Gregor von Medeazza, Megha Jain, Ajit Tiwari, J P Shukla and Nisheet Kumar looks at the implementation of the CLTS (Community-led Total Sanitation) approach led by women in total sanitation, Nirmal Bharat Abhiyan (NBA) programmes for ODF (Open Defecation Programme) in Madhya Pradesh. The best practices from the UNICEF-supported initiatives provided a platform for the Government of Madhya Pradesh to scale up NBA through the women-centric approach. Madhya Pradesh brought out the sanitation policy, the Maryada Guidelines, which gave a boost to the campaign in the State. In ‘Innovative Approaches in Communication’ Ajit K Saxena, Shailesh Mujumdar and Gregor von Medeazza discuss ‘Pan in the Van’, an innovative mobile training centre with on-site capacity building facilities that has focused on training women to provide inclusive and women-centric WASH services. The study of eighty camps held at the gram panchayat level where women were trained around WASH services, shows significant improvement in the understanding and retention of important messages, and behavioural change with reference to water and sanitation practices. The final case study ‘Liberty from Shame: Accelerating Sanitation with ASHAs’ by Amit Mehrotra and Ajay Singh is from Uttar Pradesh and examines the state-led sanitation awareness programmes carried out with the help of ASHA (Accredited Social Health Activists) workers. Over thirteen thousand ASHAs have been trained on WASH behaviour, who now act as crusaders for the sanitation programme. The concluding section draws on insights from these case studies and outlines key action agendas that can take this dialogue forward. It argues for the need of a strong policy agenda to be backed by institutional reforms and gender-responsive budgets. It has several recommendations for the government to be able to achieve gender outcomes in WASH. The authors call for a task force in the Ministry that would ensure gender equity outcomes, to enable capacity building. Monitoring of impacts and developing indicators for the same is seen as crucial. The challenge, however, according to the authors is how gender outcomes would be possible at a scale, are of good quality, and are also sustainable. The book is an important contribution to the sector with its rich case studies, each of which also reflects on the broader problems that ail the water sector, and the urgent need to address them for better gender outcomes. However, the case studies would have benefitted from a gender and power relations analysis, which is missing. The book falls into the trap of seeking solutions to the unequal gender relations by suggesting that they could be found in women-led initiatives. This is not to undermine the immense work that has gone into the case studies included here, but analysis in most of these case studies from a gender relations point of view would have helped us better understand the impact. While drudgery reduction is discussed, there is very little discussion on how and whether power relations have been challenged or whether there has been any shift in the thinking around gender division of labour, especially in the context of water. In fact, some of the case studies seem to reinforce the gender stereotypes, especially the Maryada Campaign in Madhya Pradesh which frames the entire sanitation issue, as an issue of women’s dignity. The hybrid analytical framework too misses out on the gender and power relations component that has serious implications for women’s participation in WASH. By weeding out this component from the framework, we rule out the role of the state in reinforcing patriarchy and social discrimination. As a researcher, practioner, and policy advocacy person working in this sector, I know that this is easier said than done. However, over the years in all of these capacities, I still do believe that it needs to be said. Seema Kulkarni is with the Society for Promoting Participative Eco-system Management (SOPPECOM), a non-profit organization working on issues of water, sanitation, land and rural livelihoods. Her work focusses mainly on research, advocacy and capacity building of women around natural resources. She is also a member of the National Facilitation Team of the Mahila Kisan Adhikar Manch (MAKAAM).